In moving the Octopus portal to Nancy, I wanted to have some consistency in the way errors are handled. In ASP.NET MVC/WebAPI I had a number of different filters that would handle different error conditions and return them to the user. I also then had a catch-all in Global.asax that tried to render a friendly error page if something really bad happened. There are two dimensions to the way errors are handled. First, there are different kinds of errors. Some are the user's fault (not authenticated, no permissions to perform an action, 404, validation failure). Others are our fault (internal server error). 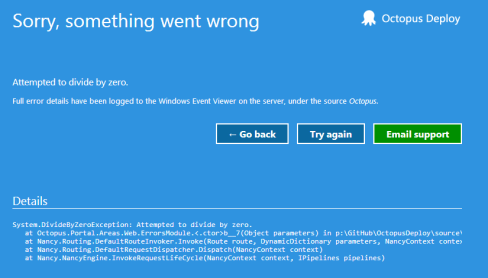 I've documented the main error status codes Octopus uses in the API documentation. Secondly, there are different user experiences that will depend on the error type and request. If the client prefers a JSON response, we'll send the status code and a JSON result containing the error details. For 500 exceptions we'll include the exception details; for other errors we'll include a description of what caused the problem and potential solutions. If the client prefers a HTML response, we might redirect to a log in screen for 401 errors. Other errors will show a friendly error page describing the problem. 400: Bad request and 403: Forbidden errors will be handled in a similar way: JSON responses for API clients, and HTML responses for real users. 401 errors will be handled slightly differently. From the API, we'll return a JSON error indicating that the API key is probably invalid, while HTML clients will receive a 302 redirect to the log in page. The final piece is my custom Response that renders the error HTML page from an embedded resource. I put this together based on some existing code in Octopus, so I'm not currently using a real Nancy view engine to do it. I'll be experimenting with turning this view into a Razor view soon. Can it be improved? I'm sure it can, since as I said, I've only been playing with Nancy for a few days. Leave a comment in the box below!